It was great to be able to participate as a UNESCO Chairholder in UNESCO’s first Partners’ Forum on 11th-12th September in Paris, and to contribute as a panellist in the session arranged by Indrajit Banerjee and his team on Responding to Opportunities and Challenges of the Digital Age. Much of the Forum focused on the successes of existing UNESCO partnerships, but our panel yesterday instead addressed practical issues where UNESCO’s Knowledge Societies Division could make a difference. 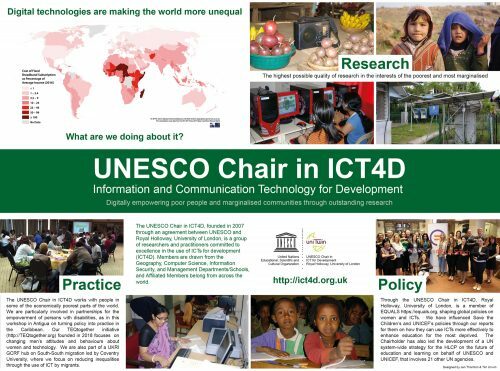 The UNESCO Chair in ICT4D has recently become a partner of ITU’s Kaleidoscope academic conference which will be held in Bangkok on 14-16 November 2016 on the theme of ICTs for Sustainable Development. We look forward to participating actively in this event, and contributing to the ITU’s academic research endeavours.